I didn’t have to stand up and make a lot of big scary decisions for much of my life. I’m not a reckless person. Practicality and I are close friends, the healthy dose of pragmatism and common sense that has served me well. I never had that moment in high school where I had to decide what I was going to do after graduation. From the time I was small, it was understood that I would be going to university. Because what else do you do when you’re a kid on the ‘gifted’ education plan? It was the only sensible choice. And when the university a couple hours away from home offered me a scholarship that meant I would not have to pay tuition for the duration of my degree, of course I was going to attend there. I didn’t even apply anywhere else. It was the only sensible choice. One of the least ‘sensible’ things I did was spend my summers through university volunteering at bible camp rather than working a ‘real’ job. But even still, for all the talk of volunteerism and sacrifice and taking leaps of faith that the money would be there to go back to school in the fall, camp always felt like the safer option for me. I knew my place there, knew I was good at my job, knew that there was community waiting to welcome me back in. I was able to say yes to camp ministry quite simply. So I went through my degree program, got decent grades and managed to never pull an all-nighter. I had friends, volunteered what was in retrospect an unreasonable amount, threw myself fully into the experience of it. Then four years later, I graduated, spent one last summer at bible camp, then got a job. After all, that was the only sensible thing to do. Fast forward to this spring. I was working full-time, had settled properly into the Monday to Friday routine. My coworkers had become my friends and I was good at my job. I knew from the start that it wasn’t a career, but a stepping stone on the way to other opportunities. But it was a measure of stability that I needed in that season, to find my feet after the constant turbulence of the four years previous. I learned a lot about just showing up, about marching onward even in those seasons where it feels like there isn't much direction to be found. I got to know some truly incredible people because of it. Those snippets of conversations with curious toddlers and World War Two veterans and everyone in between are tucked snugly into my heart. And they'll stay there, moments with the people who made the effort to learn my name and invite me into their everyday. But this spring, I knew I had to step away from it. There were about a dozen reasons for it, all starting to line up in my brain, each of them raising their hand and demanding to be heard. Stability, however, is comfortable. It wraps itself around you, does its best to convince you that everything is not as bad as all that. Because somehow uncertainty feels more frightening than slow suffocation. Then I went and heard the author Lawrence Hill speak one evening with a friend. He spoke about being a writer, about buying himself time to write by taking on freelance work rather than working a 9-5. Having had a particularly long and frustrating day at work, I sat there thinking don't tempt me, Lawrence. And it triggered something in me that wouldn’t get out of my head no matter how hard I tried. I started crunching numbers, making lists of pros and cons, trying to determine whether there was any possible way to make it work. And after days of consideration and overthinking, I finally settled on it. So I walked into the office and gave two weeks' notice. I stood up and did the Thing That Scared Me, the thing that was the complete opposite of sensible. Some were confused, told me I was crazy for giving up a full-time job without having another one lined up. But others were supportive, cheering me on even as I began my trek into the unknown. I woke up the next morning and remembered that I had quit my job. Where I half-expected to be gripped with anxiety at the thought, I found that I was entirely peaceful with what I had done, despite the fact that it appeared illogical and reckless to many. But the thing that I've had to come to terms with is that sometimes it's okay to do things that don't make sense to the people around you. It's okay to take some time to purge your schedule and your commitments and just work on figuring out who you are and where you are going, to buy yourself writing time and decide whether you're happy with the ways you have been spending your life. Sometimes it's all you can do to cling to whatever sanity you've got left at that moment and make the change. Bold moves tend to shock and confuse the people around you. That's what makes bold moves, bold; they require you to march straight out to the edge of the high dive even though you've always been terrified of water, to ignore the spectators’ questions about falling from such a great height and whether you’re ready to swim. There are seasons where the only way forward is to pause to take stock of where you've been, to rest, to create new routines and fill them with good people and good books – the ones to be read, and the ones to be written. 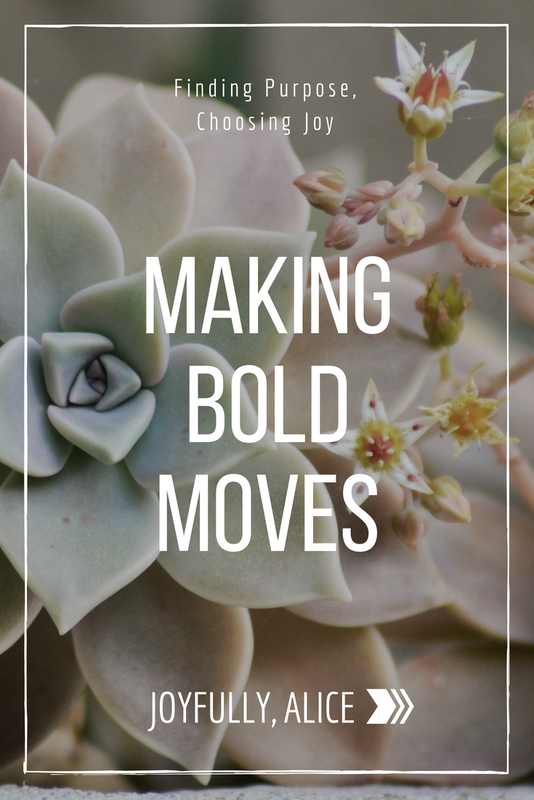 This is not to tell you that you shouldn't be afraid; bold moves are terrifying by nature. But don't let that fear stop you from doing the thing you know you have to do. Don't let fear convince you to stay in a place that is unhealthy for you simply because you're worried that this is all there is for you. It doesn’t always feel like it, but there will be another job, another person to love you, another place that can be home. Stepping away from one thing doesn't disqualify you from all opportunity forever. Sometimes it just means you're brave enough, strong enough to let go of something you’ve convinced yourself is good to make a decision that will be exactly what you need in the long run. Being bold is brave. It’s hard. It's beautiful. And it’s one of the best things you can learn to be. Because when you convince yourself to stop caring so much what other people think and just jump, you might just find the water isn’t so bad after all.